Ideal to Monitor Your Business and Monitor Employee Habits on the Job. Monitor Your Employees Internet Habits and Protect Your Business! 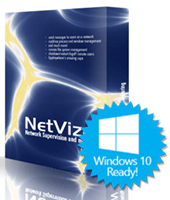 NetVizor is network monitoring software that invisibly monitors your entire business network from one central location! Track workstations and users that may use multiple PC's on your network. Deploy NetVizor business monitoring from one location and record everything users do, including screenshots, keystrokes typed, program and internet usage, emails and chats, file/document usage, and much more. Generate detailed activity reports in seconds, view your entire network in Real Time, and receive instant behavior alerts when unwanted activities occur. Combining real time remote surveillance with complete computer activity monitoring, behavior filtering, alerting, reporting, and security auditing, NetVizor is the most comprehensive network monitoring and administration solution available anywhere! NetVizor business monitoring can be rolled out from one central computer across your entire network. Logs and reports can be viewed for any computer/user from one location. Web-based remote administration allows you to view/control computers in real time, as well as view every desktop on your entire network in real time via a tiled display. NetVizor business monitoring can also show you what users are typing in real time, and provides an activity ticker so you can see what every network user is working on in Real Time. NetVizor business monitoring can present an accurate network-wide depiction of activity on your network in seconds by creating network-wide reports detailing what computers are the most active, activity trend analysis reports, top 10 usage reports, detailed activity log breakdowns, and more. NetVizor business monitoring prevents data theft by logging all file usage, documents viewed and printed, file transfers, and even blocks and alerts you when portable drives are connected to computers. NetVizor can alert you when computers are relocated as well - such as a remote laptop being moved to another site. 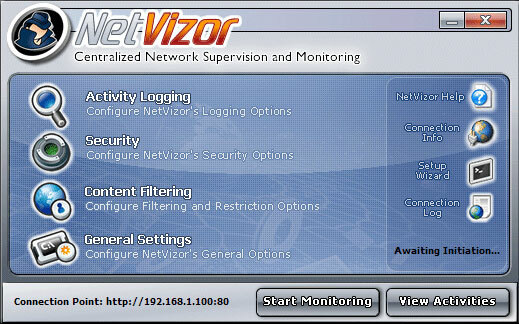 NetVizor employee monitoring prevents unauthorized websites, programs, and chat clients from being used. NetVizor will alert you in real time when users perform unwanted application, website, or file activities. You can also be alerted when specific keywords are typed, and when portable drives are used. NetVizor employee monitoring is designed to operate on networks of all shapes and sizes - from small single-subnet networks to large 10,000+ computer networks consisting of multiple subnets and divisions. NetVizor business monitoring can be used to monitor off-site/remote computer activities as well.